I don’t buy a lot of stuff for myself (my favorite pair of shoes I’ve worn for like, three years, and my favorite necklace I made myself . . . get me? ), so I depend on holidays and birthdays and relatives and gift cards to feed my book-buying habit. Thankfully, the guy I’m sorta married to but not allowed to talk about online totally came through for me this year, buying twelve books on my “To Read” list (for twelve days of Christmas, maybe? Three he gave me early: the last Twilight book (Breaking Dawn), which was incredible, as always; Life of a Teenage Siren by Wendy Toliver, which I sped through and was such a cute story; and Second Virginity by Sara Hantz. He also pre-ordered Along for the Ride (Sarah Dessen) which will be released in June. Yay! My “To Be Read” pile runneth over! This should get me to March . . . maybe. This holiday season I’m thankful for wonderful YA writers who not only keep me entertained, but who are my teachers, mentors (whether they know it or not), and friends, and a certain dude not to be mentioned who willingly feeds my book addiction. I’m also thankful for a great group of Debutantes . . . because 2009 is fast approaching, and is already looking like one crazy year (www.feastofawesome.com). Even though I still have a few papers left to grade, I’m officially posting my “On a Holiday” announcement. Contact with the internet world will be sporadic, because what I really need to concentrate on is watching the hours upon hours of Christmas movies I’ve somehow missed over the last few weeks. And now I leave you with Christmas Greetings and an adorable green froggy. . . .
Wishing you and everyone you love a safe and happy holiday season! I know that some people don’t like getting tagged or filling out meme’s, but that is *so* not me because it gives me good material for my blogs (that I just *cannot* seem to find time to update). Write 16 random things, shortcomings, facts, habits or goals about you. At the end choose 16 people to be tagged. You have to tag the person who tagged you. 1. One Wish is the first “official” young adult book I’ve ever written, but I have at least eight finished YA manuscripts currently collecting dust on my laptop (some on submission, some destined to be forgotten forever . . . if I’m lucky). 2. I’m not emo or anything, but my favorite clothing color is black and I love wearing chokers. 3. I love vintage/reproduction jewelry (hence the chokers). 4. I will never get a tattoo because I don’t believe in subjecting myself to unnecessary pain. It’s also why two earring holes (on each ear) are the limit. The last set nearly made me cry. 5. I hate crying in front of people because I see it as a sign of weakness (not if YOU cry . . . that’s okay. It’s just that I avoid it at all costs). I also tend to shut down emotionally when I’m not in control (Okay, and I totally just confessed I wasn’t emo . . . like you believe me now). 6. The message behind a lot of my YA books is about being in control (or not). I clearly focus on the messages I need most. 7. My worst photo ever was my school picture circa seventh grade. I’m wearing a terrible white/yellow sunflower dress, my elbows are pointy, my hair is frizzy and my teeth are crooked. It still gives me nightmares. 8. I once wore said sunflower dress to church . . . with purple underwear . . . and actually played the piano on stage that night. . . . Had NO idea ‘til a friend lovingly pointed it out, after which I died from humiliation. 11. I did research on vampires in a grad school mythology class (like, a comparision of vampires in folklore versus how they’re portrayed in Hollywood and in novels . . . I know: Nerd Alert!) and had terrible dreams for weeks after I turned it in (at least I got an A!). The vampires were clearly after me, and they would not die. This, of course, was pre-Stephenie Meyer . . . because I will admit I am madly in love with a certain vampire named Edward Cullen and he is welcome to show up in my dreams anytime. . . .
12. I cheated to pass an Algebra class and forged my mom’s signature on every failing test my teachers sent home. 13. I keep a running list of things I want to do/experience in my lifetime, like visiting Europe. 14. I tend to have a thing for guys with British accents (Colin Firth, anyone?) and I love romantic comedies: the cheesier the better. 15. I love history . . . and learning . . . I hate that it took so long for me to realize that. 16. Even though I’m the strangest, quirkiest person I know . . . I’m glad that I’m in a place where I’m happy with who I am. It’s okay that I probably wear too much black and have stockpiled embarassing/humiliating moments over the years; that I’m a borderline control freak, and have made some pretty hideous choices; that my ipod is so full of classical/instrumental music randomness that it’s embarrassing . . . I’m glad to be me, and I wish I knew then what I know now. I’m not tagging 16 people (hopefully something *bad* won’t happen to me), but if you’re reading this you’re welcome to participate.! I got a special delivery this week! 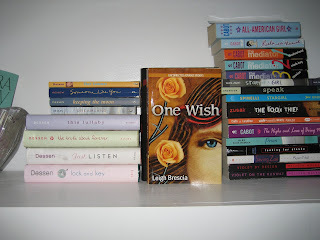 Advanced Readers Copies of ONE WISH! I’m kind of nervous about reading it, because even in skimming I’ve already seen things that I’d edit if I could and, well, it’s just too late for that. I really don’t want to go all neurotic on anyone, but just the thought that my book is out there for people to love, like, and even hate (shudders) . . . okay, yes, I’m completely neurotic. I have a terrible habit of worrying too much about what other people think. What is important here is that Wrenn had a story she wanted me to tell, and I told it the best way I knew how. Synopsis: Overweight Wrenn Scott desperately wants to be popular and snag a hot boyfriend. Living with her single mom and younger sister, Karly, she lands a lead role in the high school musical, her voice for once overshadowing her weight. Pushing to get thinner by opening night, Wrenn's waistline shrinks as she learns all the wrong ways to lose weight from a new "it-girl" friend in the show. Meanwhile, her mom is falling for Phil, "a balding Channel 8 News-nerd"; her sister is wrapped up in her own share of middle school drama, and Wrenn's best friend has fallen for a guy she met online—but hasn't even seen yet! Topping it off, geeky stage manager Steven has a crush on her. But Wrenn doesn't want to be seen with him—she's holding out for a trophy boyfriend whom everyone will envy. By opening night, the old Wrenn has almost disappeared. After a crisis reveals her weight-loss tricks, Wrenn realizes there are much more important things than being thin, popular, or even dating a hunk. Despite the neurosis and random freak-outs, this has been a pretty awesome week for me! I hope yours has been just as great! It's the Most Wonderful Time. . . .
On this first day of December (since it’s after midnight, I’m on a technicality), you will be happy to know that Christmas preparations in the Brescia household are fully underway. In the three days since Thanksgiving, I have . . .
1. Eaten way too much sweet potato casserole, but since it’s like, the only vegetable I consume all year, it’s okay. 2. Officially changed my desktop background to a “Christmas” photo. 3. Set my radio dial in my car to the Christmas station (am still waiting to hear Feliz Navidad). 4. Watched the Garfield Christmas special on DVD at least five times (could be more, but not sure, as things are sort of hazy at this point). 5. Watched Elf (or parts of it) three times. 7. Watched the guy I’m sorta married to but not allowed to talk about online complete the majority of our Christmas shopping online, then subsequently wrap and label each package once it arrived. 8. Listened to my Kenny Rogers and Dolly Parton Christmas CD in its entirety . . . proceeding to dance around the room and sing “I’ll be Home with Bells On” at the top of my lungs (a Christmas tradition). 9. Watched my favorite Christmas commercial: the Hershey’s kisses that ring “We Wish You a Merry Christmas” . . . because that little kiss who’s relieved his part is over is so cute! 10. Put up half of the Christmas decorations. All that’s left is the “big” tree (the real one we put in the living room, because everyone knows that “Christmas tree smell” is my favorite). I will tackle this tomorrow . . . today. Well, later today after I wake up. What gets you in the mood for Christmas? Elf? Kenny and Dolly? Fess up!